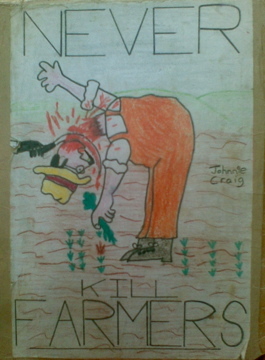 So began Never Kill Farmers, my juvenile foray into novel writing. I like to call it ‘my first novel’, because I believe you should always have a couple of crap attempts at long fiction under your belt before trying to get anyone to take you seriously. It took me approximately three weeks to write, came in at around 25,000 words and, despite its promising start, was complete and utter rubbish. In the spirit of my new year resolution to write more fiction, I sought this out in a box of teenage memories, mainly musical ones. It did stir a little school-related nostalgia in me but that was as far as the enjoyment went. I did little else but flick through the pages, stopping at parts that seemed potentially interesting, only to discover that it was the excruciating work of a frustrated, virginal 15-year-old. Why I wrote it, I have no idea – perhaps I had an excess of half-ideas I needed to use up. The protagonist, Timmy, leaves home, is kidnapped in a case of mistaken identity and ends up at a hostelry run by Archibald, a crazed fan of reclusive English poet, John Vernon Smith. Agreeing to help locate the poet (despite persistent rumours he is dead), the pair travel across Europe picking up clues as to Smith’s whereabouts, Archibald reciting his awful poetry at every opportunity. They narrowly avoid death several times, via run-ins with a vampiric school teacher, alleged aliens invading a convenience store, a consignment of poisoned sausage rolls and a stormy journey in a fishing vessel run by a delusional sailor who calls himself Captain Kirk. Eventually, they locate J.V Smith in a home for the criminally insane, and help him to escape, only to discover ‘he’ is actually six different people, all of whom are serial killers. The ending is distinctly unsatisfactory and can’t be repeated here, save for the “revelation” that, in the likely ensuing slaughter, farmers were to be spared. The reason it is called Never Kill Farmers is because of that cover illustration – a clear case for always judging a book by its cover. I copied it from an original drawing by my then geography teacher Miss Irving. She had used it to help illustrate “The Factors That Influence Farming” on her overhead projector. Typically, I decided to lop the farmer’s head off with a scythe, leading to a rush of “inspiration”. I should say that, despite this substandard fantasy adventure, I was generally rather good at writing fiction in school, usually receiving excellent marks and impressing my English teachers. It is probably just as well they didn’t get to see Never Kill Farmers – no one else will either. This entry was posted on January 8, 2012 at 12:13 pm and is filed under Books, Fiction. You can follow any responses to this entry through the RSS 2.0 feed. You can leave a response, or trackback from your own site. Maybe one day… until then, it’s under lock ‘n’ key!